Zika virus (ZIKV) is a mosquito-borne virus that has garnered a lot of attention in recent years, due to the explosive epidemic from 2014 to 2016. Since its introduction in the Americas in late 2014, ZIKV has spread at an unprecedented rate and scale throughout the world and infected millions of people. Its infection has also been associated with severe neurological disorders like Guillain-Barré syndrome and microcephaly in fetuses. Despite these, there is currently no approved antiviral against ZIKV. 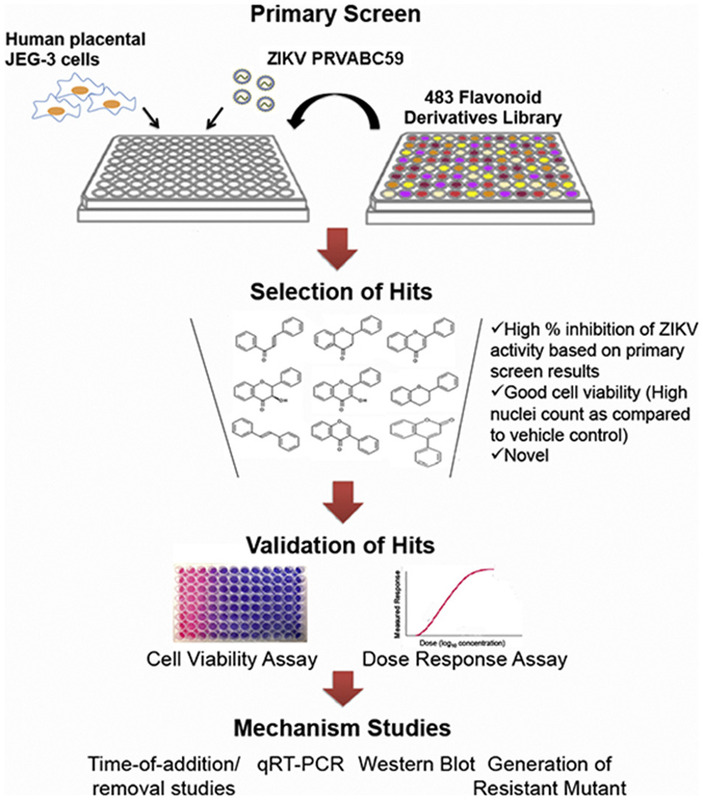 In this study, an immunofluorescence-based high throughput screen was conducted on a library of 483 flavonoid derivatives to identify potential anti-ZIKV compounds. Flavonoids, which are natural polyphenolic compounds found in plants, represent an attractive source of antivirals due to their abundance in food and expected low toxicity. From the primary screen, three hits were selected for validation by cell viability and viral plaque reduction assays. 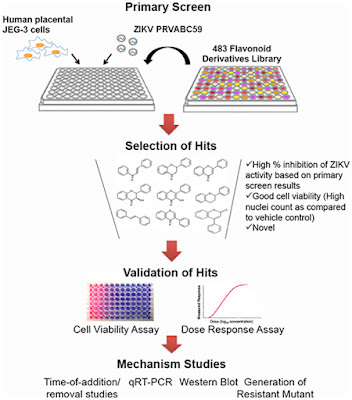 Pinocembrin, a flavanone found in honey, tea and red wine, was chosen for downstream studies as it exhibited the strongest inhibition of ZIKV infection in human placental JEG-3 cells (IC50 = 17.4 μM). Time-course studies revealed that pinocembrin acts on post-entry process(es) of the ZIKV replication cycle. Furthermore, pinocembrin inhibits viral RNA production and envelope protein synthesis based on quantitative reverse transcription-PCR (qRT-PCR) and Western blot analyses. This study has demonstrated for the first time the in vitro anti-ZIKV activity of pinocembrin.